Plate nine from the second set of Thomas and William Daniell's 'Oriental Scenery'. Madras was the first important settlement of the East India Company and was founded in 1639. Construction began on Fort St George in 1640, but it was later enlarged and a Government House was built inside its fortifications. The colonnade on the right leads down to the Sea Gate. 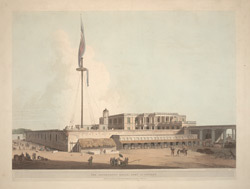 It was the centre of all East India Company business for the Madras Presidency.